“The International Monetary Fund is warning that the world economy is slowing—and that it will get worse if countries keep squabbling over trade. The agency’s updated World Economic Outlook lowered estimates for growth in 2019 by 0.2 percentage points to 3.5%, its second downward revision, this time on account of weakness in Germany and Turkey. “And even as the world economy continues to move ahead, it is facing significantly higher risks, some of them related to policy. These risks are now increasingly intertwined: think of how higher tariffs and rising uncertainty over future trade policy fed into lower asset prices and higher market volatility. This in turn contributed to tightening financial conditions, including for advanced economies, which is a major risk factor in a world of high debt burdens. 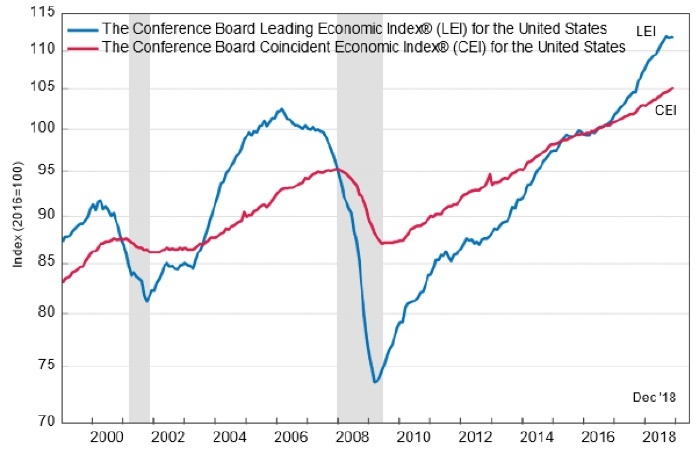 That said, the trend line for both leading and coincident economic indicators has not yet shown any significant deterioration. The question is whether peak levels for the post-recession cycle have already been reached—or are soon going to be. One of the most notable earnings stories came out on Jan. 28, when multinational equipment-maker Caterpillar (CAT) missed profit expectations for the fourth quarter and full-year 2019 profit estimates were in a range below consensus estimates. Analysts are obviously wondering if Caterpillar’s performance is foreshadowing a macro-economic slowdown.